Connor Cape, voice of the Colorado Rapids and host of “The Connor Cape Show” on Mile High Sports AM 1340 | FM 104.7, makes his favorite NCAA football picks every week. Feel free to reach him on Twitter at @MileHighCape to tell him how great he’s doing… or if he missed by a country mile. Again. Week 1 is notorious; it’s the most difficult week to pick for an obvious reason: nobody really knows a single thing about these teams other than the results of spring games and possibly misleading depth charts. But what else are we going to do? Wait all spring and summer, just to prolong the wait until week 2? I don’t think so…. It’s picking time! 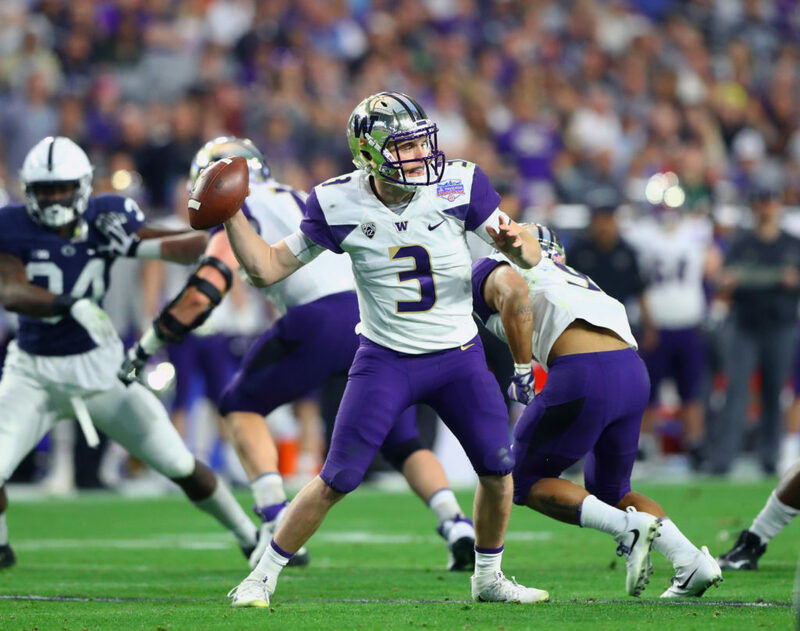 Washington is a trendy pick to represent the Pac-12 in the college football playoff, and they can earn the respect of the country and ride it through November with a victory over an SEC powerhouse – in SEC country. While I respect Auburn and QB Jarrett Stidham, I’m concerned that the Tigers always seem to start slow. This is the game of the week for me. If you’ve ever listened to my show, you know I think that Jim Harbaugh has underperformed at his alma mater and that Brian Kelly has never really seemed like the right guy for Notre Dame. Two of the most successful programs in college football history have struggled to step into the spotlight in recent memory. So in this situation, favor the Irish against a Wolverine team that views offense as optional. This pick is based on trends. Mark Richt is 6-0 in September in two seasons at ‘The U’, Ed Orgeron is 3-2 (small sample size, I know), which includes a loss to Troy. It’s subjective, but I think most everyone agrees that the trajectory of these programs are heading in opposite directions – and LSU’s isn’t facing skyward. The Tigers break in a transfer QB, along with a brand-new stable of running backs and receivers with limited production at this level. For Miami, this is the year they take the next step and challenge Clemson for an ACC title. Willie Taggart will eventually have the Seminoles humming. The Florida native went 10-2 at USF and will recruit circles around everybody else in the Sunshine State… but it’ll take time. That 10-2 season was in 2016, followed by a 7-5 one-year pit stop at Oregon before returning home. On the other side, it’s Justin Fuente’s second season in Blacksburg and he’s either going to show us the offense that got him the job, or he’s in a tough spot. The former is more likely than the latter, and 7.5 is just too big a number. Will Grier is an early Heisman favorite, West Virginia is a dark horse for the playoff – and it’s going to be a complete rebuild for Jeremy Pruitt in Knoxville. Defense takes longer than offense to get going early in the season, Tennessee didn’t win a conference game last year and everything points to a 9.5-point line as being too small. It feels so obvious to pick the Mountaineers in this spot that I’m double-checking Twitter every half-hour just to make sure Will Grier is still the QB. The only cause for concern is WVU lacks depth. Any injury could bring this game closer to even. Both teams are replacing major weapons on offense. For Appalachian State, it’s four-year QB Taylor Lamb, and for the Nittany Lions, it’s Saquon Barkley. But that just means the game could be Trace McSorley’s chance to announce himself as a Heisman candidate and for Penn State to announce they’ll be representing the Big Ten in the playoff. But it won’t be either of those things, because Appalachian State is a damn good football team. This won’t be the same outcome as 11 years ago, when the Mountaineers traveled north to a Big Ten stadium and shocked the world — but they’ll hold their own and keep it respectable. Remember earlier in this column, when I mentioned that LSU was 3-2 in September, including a loss to Troy? These are those Trojans. Taking the home underdog at night is a cliché, but it’s a cliché for a reason. I think Boise wins the Mountain West and has a chance to go undefeated and crash a ‘New Year’s Six’ bowl, but Troy is not to be taken lightly. Last year, the Trojans went 11-2, with losses only to South Alabama and these Boise State Broncos. Neal Brown is 25-13 in his three years in Troy and won’t be there for long. Use this opportunity to hop on the hype train. The Red Raiders are favored by 2.5 in this neutral-site matchup, but I don’t know why. I don’t even know why they bothered with setting a line – this game is going to come down to who has the ball last. There will be points, points, points all morning and your Twitter timeline will be a stream of “I missed this,” and “This is the perfect way to start Saturday,” as each team marches up and down the field in seven-play drives averaging 11 yards per play. This game is going to be a shock to the system after so many months without college football. Be sure to watch a Big Ten game after to bring your blood pressure back down! Catch The Connor Cape Show every Tuesday through Thursday from 8p-10p on Mile High Sports AM 1340 | FM 104.7 or stream live any time for the best local coverage of Colorado sports from Denver’s biggest sports talk lineup. Download the all-new free Mile High Sports Radio mobile app for Apple or Android.